Please keep in mind these were LONG before the days when that magical chef with the orange Crocs showed up, when people ordered food to eat rather than to Instagram. WAY before vodka was infused with bacon, and before tacos were gourmet, when the party-throwing world was a Pinterest-pressure-free zone. These were more of the “I’m gonna work in the food industry because I’m on parole” kind of times. After graduating from Georgetown University, I figured it was no more games, I actually did have to figure out what I wanted to be for real this time. I’d set my sights on being actress, so I worked as a coat check girl at Nobu (where I was fired and given the honor of being called “the most inconsistent, unreliable employee” they’d ever had), auditioned for James Lipton for a coveted spot at The Actors Studio (he basically laughed me off the stage), worked for an entertainment agency (where I was fired for sending in my head shot for the role of Meadow Soprano instead of one of the actress I was supposed to be representing), dabbled in fund-raising, took jazz dance classes, went to grad school for a semester, and played a terrorist in an off-off-off Broadway play. After a string of short-lived jobs, and not much success in the acting world (unless you consider being an extra in Whit Stillman’s The Last Days of Disco success), I randomly answered an ad in The New York Times that listed “Upscale boutique catering firm seeks temporary employee to work with art, fashion and entertainment clients.” I was drawn to “entertainment” and “temporary.” A week later, I began my new role as Mary Giuliani, Catering Sales Representative. But, little did I know that this job, which I took with no greater hopes than to be able to pay my cable bill, would be my ticket to a world I could only have imagined entering, with a trusty pig in a blanket as my admission ticket! For the first time it all made sense: I was good at throwing parties, loved working creatively with food and drinks, and found that my greatest joy came from stepping back and watching our clients enjoy themselves at the parties I was overseeing, which were like mini theatrical performances[AC2] . And while Robert De Niro was never gonna hand me that Oscar, I traded in that dream for another and offered him a tray of crab cakes instead. And then the realization set in that for the first time, that after being gifted all the amazing glimpses my career had allowed me, I did not aspire to be anyone else but me! I wanted to be exactly what I was—”their caterer”—because nothing brought me more joy than a happy smile or a sincere thank you at the end of a party. I was hooked. 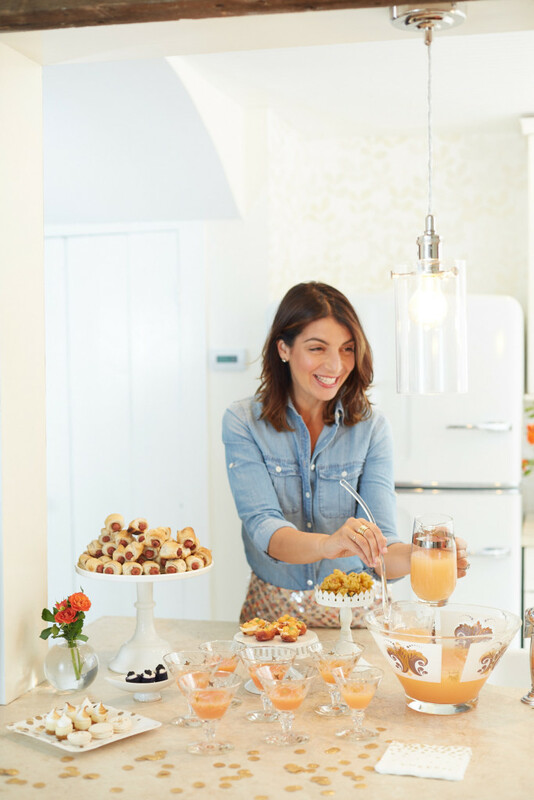 I started to think about food and beverage as an extension of my clients, what they were looking to promote, what they wanted to say, and I was so excited to go off on my own and express these thoughts creatively with my unique food and beverage ideas. The sky was the limit. As I came into my own in the catering world and developed all these ideas for my clients, I knew that I would eventually leave my mentor and devote my energy to growing my own business. I felt very strongly that we were being given the opportunity to work with the finest names in art, fashion, and entertainment and it was up to us to make sure that we never took that gift for granted and constantly tried to source the best food and drink experiences for our clients. And I made the decision early on that even though the clients were fancy, our attitudes were going to be anything but. I needed to stay true to who I was and what I liked about food and gathering. I was not a superfoodie, and it was important to me that the food experience felt inspired, welcoming, and like going home. The experience would be unique, whimsical, comfortable, and approachable with nostalgic warmth. We would seek food inspiration from unlikely places. And while some people thought serving mini grilled cheese and tiny hamburgers would never work for the A-list of the A-listers, Mary Giuliani waiters could be found serving just that up and down the chicest stores and residences on Madison and Fifth Avenues. Within our first year of business, we did parties for InStyle, Vogue, The Rolling Stones, and even Harry Potter!!! You should know I was so petrified that our young company could pull off such a large event (The Harry Potter movie premier) that I spent half of the party hiding in a bathroom stall praying (I’m not kidding). When I look back and think about how this all happened, I’m not really sure. I think luck, timing, a keen eye for talented chefs, hardworking waiters, passionate planners, and the fact that my husband and I were growing this together during a fabulous food boom had lots to do with it. I think pushing the envelope and dancing to the beat of my own drum by breaking entertaining norms was a refreshing new perspective in the New York catering scene, so the greater the response to a new tray or food concept, the more I was inspired to get really creative and dig deep for more new and exciting ideas and concepts. Mostly, though, I think it’s because I’m motivated purely by making people happy. I served (and still do serve) straight from my heart, to both my clients and my employees. I remain grateful to be in the game, grateful that I get to do what I love, and especially grateful for every entry to a new place, brought to me via a tray of pigs in a blanket. This year, Mary Giuliani Catering & Events will celebrate its tenth year in business, we have fifteen full-time employees and two amazing business partners, and I’m still happy to work in the home I helped build with a dream. My next new dream is to be welcomed into your home, as your new pal and trusted source for throwing your own hassle-free parties. The same philosophy that I apply to serving my clients now goes for you. It doesn’t need to be fancy or difficult to be amazing and memorable, so, in the pages that follow, I wish to share with you all that I learned from years of victories (many), mistakes (many), and the how did I get into this party? moments. The food may be small, but the stories I’ll share will be big. I’d love to encourage you to shake things up (both on your table and in your glass), and offer you a reminder that there is no such thing as a “perfect life” or a “perfect party.” I’m going to show you my trusty, go-to tricks, that will save you from party stress and at the same time get you to kick off your shoes, turn up the music, and dance around your kitchen before your guests arrive. Do you have to be a chef to use this book?? Not at all! I am not a chef. I am just someone who deeply loves gathering people and providing them with great food, drinks, and memories. And if you love that too, then you already have the greatest ingredient for your next party. I hope that in reading The Cocktail Party, that you’ll feel like you have a pal on the inside who wants to see you succeed. That you will take away a few key ideas and approaches, including that parties should always make people laugh, that mini grilled cheese sandwiches are never a bad idea, that mac and cheese can be served on a Ferris wheel, and most important, that even if you don’t know what you want to be when you grow up (no matter how old you are), your dreams can come true . . . including the ones you didn’t even know you had.